From the late 18th century up until the early 1960s, various fuel sources like coal, gas, oil, and wood were used to heat the water contained in steel boilers. This water was then transported to radiators through a system of pipes in order to reach the centralized heating of a residence. Unfortunately, that period of time, when these boilers were used on a large scale, concurred with the discovery of asbestos, which was considered a breakthrough in the field of materials engineering. Given its heat-preserving properties and exceptional fire resistance, it did not take long for asbestos to be incorporated in residential boiler components, especially in insulation. What people did not know at the time was that this revolutionary mineral could become extremely dangerous when damaged. Therefore, workers who performed the installation, repairing, or maintenance of boilers were frequently exposed to asbestos fibers, which, if inhaled or swallowed, could cause various types of cancer. Although boiler systems might seem simple, they are actually quite complex, since every component demands a certain level of heat control. While pipes and boiler tanks require insulation to keep the heat from dissipating, the surrounding environment of the boiler is also covered with insulation to prevent overheating. Raw asbestos: used as a filler for holes. Besides the asbestos exposure which can happen when the mineral present in the components of residential boilers becomes friable, the most dangerous form of exposure to asbestos takes place during the installation, maintenance, and removal of boilers. Workers who performed these operations would often need to drill and cut to shape asbestos insulation, both activities causing the release of huge amounts of asbestos fibers in the air. This air would not only be inhaled by the workers installing or repairing the boiler, but also by the inhabitants of the house. Since residential boilers were usually located in the houses' basements, the air would take long to purify due to poor ventilation. As a consequence, homeowners were at risk of prolonged asbestos exposure, thus being susceptible to developing several forms of cancer, such as mesothelioma. 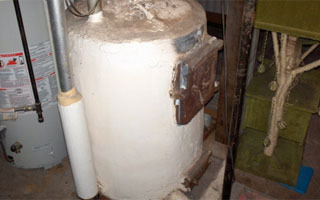 If you were thinking of removing an old boiler by yourself, it is time to reconsider your choice. Unless you want to contaminate your house or, even worse, your whole neighborhood, we recommend you to contact a licensed abatement company to help you out. While it can be costly, having your boiler removed by someone who can ensure the safety of your home is better than putting a death sentence on your family members.